"I must find the people who did this." The Lost Son stars Daniel Auteuil as Xavier Lombard, a troubled, aging private eye working in London after an ignominious resignation from the French police force. His work tailing unfaithful spouses and the like is interrupted by a request from his old friend Carlos (Ciaran Hinds), who asks him to assist his wife Deborah (Nastassja Kinski) in her family's search for her missing brother. As Lombard digs into the case, he uncovers a covert child prostitution ring. His mission becomes personal, and violence ensues. Watching The Lost Son, one can't help but suspect that the filmmakers have hit on the most convenient brand of villainy since Silas Warner pitted videogame players against Nazis in the original Castle Wolfenstein. Child exploiters are so roundly despised that Lombard's increasingly violent, take-no-prisoners treatment seems justified prima facie. Unfortunately, in this case the idea becomes a cheat, an excuse for the script's near-total neglect of character development, motivation, human warmth and anything else that would make the film watchable. Lombard rescues children from child molesters, hence he must be a hero. End of story. The fault seems to lie primarily with the script. Auteuil and director Chris Menges do their best to make the lead character credible, with some nice details, like Lombard's minimalist one-puff cigarette habit and a scene in which he has to ditch his gun before embarking on an international trip, buying a new one after he arrives in Mexico. Nastassja Kinski is intelligent and fiery in one of those "two days, two sets" roles accorded to bankable stars in low-budget productions, and the bad guys are appropriately vile, especially Bruce Greenwood as a self-righteous "child rancher" who claims to be saving his "products" from life on the streets. Menges' long career as a cinematographer pays off in some nice compositions, and the production as a whole is well put-together. Unfortunately, the story just doesn't hold water. It's the worst kind of Hollywood detective-movie cliché combined with European production values, drowning some talented actors in a sea of action-oriented "dramatic" moments. Everyone seems to be "going through the motions" here, and the film elicits almost no sympathetic emotional response from its audience despite its subject matter. Not recommended. Image Transfer Review: The Lost Son retains its original 1.85:1 widescreen theatrical aspect ratio, but it's presented in nonanamorphic format, apparently mastered from a video source. Heavy edge-enhancement abounds, shadow detail is very limited, and many shots suffer from poor detail and smeariness, especially in outdoor sequences. The occasional English subtitles (for French dialogue) are "burned in" and cannot be turned off, and the end credits are very soft and difficult to read. One of the worst DVD transfers I've seen, and way below current standards. Audio Transfer Review: Artisan presents The Lost Son in its original Dolby 2.0 Surround audio format. The soundtrack features some decent bass and a conventional, reasonably active Dolby Surround mix—dialogue centered, music spread out, and some sound effects panning across the front soundstage. Nothing spectacular, but the digital transfer seems clean enough. Extras Review: Artisan supports The Lost Son with an ample 34 picture-menu chapter stops and little else. Cast & Crew biographies and filmographies cover 6 actors and 7 members of the production staff—the biographical notes are brief but informative, and the filmographies seem complete. That's all that can be said in this department. 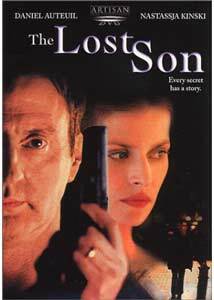 The Lost Son is an attractively-photographed but hopelessly trite bit of film noir that fails in its attempt to blend European aesthetics with Hollywood plotting. Artisan's DVD features a poor, video-mastered transfer and no substantial supplements. Not recommended.